GMV Announces Revised Mineral Resource Estimate On Its 100% Controlled Mexican Hat Gold Deposit, Cochise County, Arizona | GMV Minerals Inc.
VANCOUVER, BC, JULY 17, 2018 – GMV Minerals Inc. (the “Company” or “GMV”) (TSX-V: GMV) is pleased to announce that it is in receipt of an updated Mineral Resource Estimate (“MRE”) prepared by Tetra Tech Canada Inc. (Tetra Tech), Dr. D.R. Webb, Ph.D., P.Geo., P.Eng., and Mr. John Fox, P.Eng., on its 100% controlled Mexican Hat gold property located in S.E. Arizona. The Inferred MRE of 32,876,000 tonnes grading 0.616 gpt gold at a 0.2 gpt cut-off, contains 651,000 ounces of gold, which is a 22% increase of contained ounces from the previous MRE (Webb, 2015). The MRE is reported as a pit constrained resource completed using Whittle software optimization. 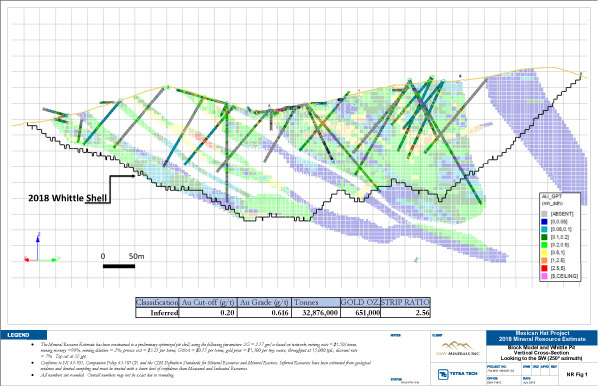 Whittle software was used to determine and optimise the economics of open pit mining projects. Its unique capabilities enabled the Company to analyse pit designs in the context of physical, economic and mining constraints according to specific mining, metallurgical and other costs relative to the grade, gold price, recovery as well as other revenue inputs. This allows for the determination of what portion of a larger block model might be reasonably recoverable. The pit constrained results are presented in the table below. The pit constrained figures are used to meet the CIM Best Practices definition of reasonable prospects for economic extraction realistically reflecting the location, deposit scale, continuity, assumed mining method, metallurgical processes, costs and reasonable long-term metal prices appropriate for the deposit. The Mineral Resource Estimate benefits from exceptionally high average metallurgical recoveries of 89.9%, and a favourable geometry of the resource underlying Mexican Hat Mountain. No clay issues have been identified in any of the leach tests that have been completed. The limits of the resource have not been delimited to the south, east, and depth where further work is recommended to define the size of the deposit. The Mineral Resource Estimate has been constrained to a preliminary optimized pit shell, using the following parameters: SG = 2.57 gm/cc based on testwork, mining costs = $1.50/tonne, mining recovery =98%, mining dilution = 2%, process cost = $3.25 per tonne, G&A = $0.55 per tonne, gold price = $1,300 per troy ounce, throughput at 15,000 tpd., discount rate = 7%. Top cut at 32 gpt. Gold mineralization is hosted within strongly fractured and altered per alkaline Tertiary volcanic rocks disposed within the basin and range province that extends from Nevada through into Mexico. Mineralization is associated with alteration that is dominated by hematization, carbonatization, chloritization, sericitation and only limited silicification. Sulphides are rare to absent throughout much of the rocks, even at its deepest levels. Nine mineralization solids were created using Geovia GEMs software to delimit the unique mineralized domains. The solids constrained drill hole intercepts that were composited into uniform 1.5 m lengths with all unsampled values assigned zero grade. Rotated anisotropic search ellipsoids varying from 35 to 50 m in the long dimension and 15 to 22m in the short dimension were used for first pass estimations requiring a minimum of 8 and a maximum of 16 composites to generate a resource block, with no more than 4 composites allowed from any one drill hole. Second and third pass estimates increased the search ellipsoid dimensions by 50% each expansion while the minimum number of composites were reduced to 5 and then 4 on the second and third passes. Inverse distance cubed estimation techniques were selected. All high-grade gold values were capped to 32 gpt. Dr. D.R. Webb, Ph.D., P.Geo., P.Eng. and J. Barr, P.Geo., and John Fox, P. Eng. are the Q.P.s for this release within the meaning of NI 43-101 and have reviewed the technical content of this release and has approved its content. GMV Minerals Inc. is a publicly traded exploration company focused on developing precious metal assets in Arizona. GMV, through its 100% owned subsidiary, has a 100% interest in a Mining Property Lease commonly referred to as the Mexican Hat project, located in Cochise County, Arizona, USA. The project was initially explored by Placer Dome (USA) in the late 1980’s to early 1990’s. GMV is focused on developing the asset and realizing the full mineral potential of the property through near term gold production.